The Frugal Family Life: *HOT* Bath & Body Works 3-Wick Candles ONLY $8.50 (reg. $22.50)! 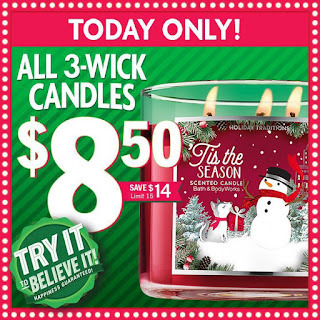 *HOT* Bath & Body Works 3-Wick Candles ONLY $8.50 (reg. $22.50)! This is a *HOT* sale! Bath & Body Works has their 3 Wick Candles for ONLY $8.50 (regularly $22.50)--that's a savings of $14! This is valid in-stores only. No coupon needed. Limit 15 per person. Make sure to spread the word!